"Is Saul Also among the Prophets?" Upper left margin: This is the image of the prophet Samuel to whom the company of the believers said, "There must be a king amongst our tribe." Samuel said, "Whoever becomes your king, he shall harm you and kill you." They said, "We accept whatever he does." Upper right margin: One of the believers was named Saul and he went before the prophet and Samuel, according to God’s command, made him king and anointed him and kingship was granted to him. Lower left: And Saul, in the presence of the community, was given prophethood by God. Lower right, above and below Latin inscription: And the prophet Samuel presented Saul to the people and said, "This is your king." They consented and said, "Long live the king!" 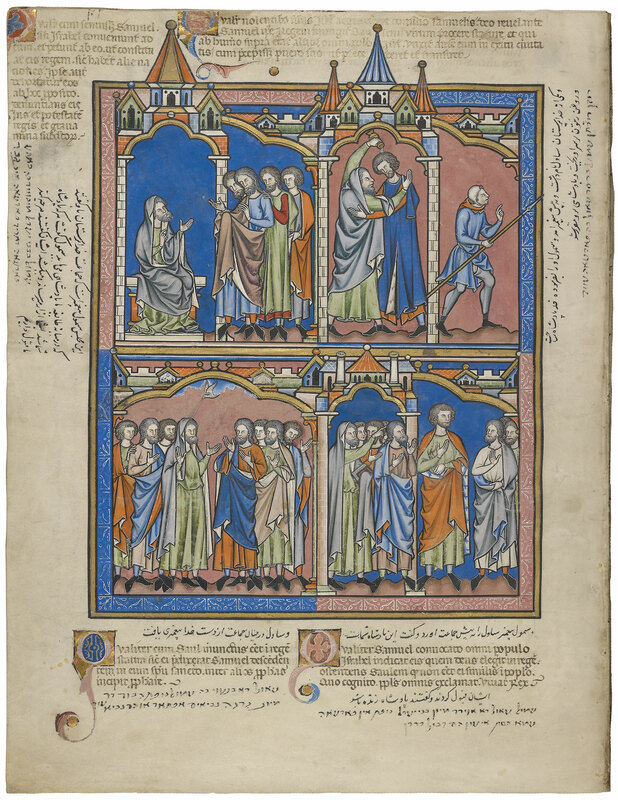 Upper left margin, furthest left: Samuel is saying to the Children of Israel, "If you want to have a king, the king [will bring] oppression..."
Upper right margin, furthest right: Samuel’s anointing of Saul so that he would become king. Lower left, beneath Latin: Saul, as Samuel had said, fell into the circle of prophets and he also prophesied. Lower right, beneath Persian: Samuel brings Saul among the Children of Israel, saying: "This is your king." They accept him.